Nina is the most expressive dulcimer player I have ever heard. Many play from the heart. Nina plays her soul. 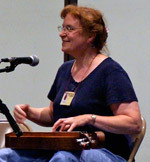 Nina Zanetti is the 2008 National Mountain Dulcimer Champion. She comes to the mountain dulcimer from a diverse musical background, including choral music, violin, viola, piano, and shape note singing. 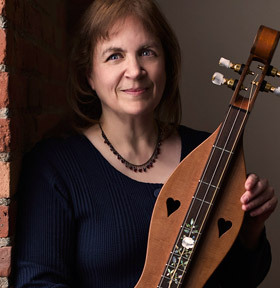 She plays regularly at churches, historic sites, and community events and has taught workshops at dulcimer festivals throughout the country, including Western Carolina University, John C. Campbell Folk School, and Kentucky Music Week. 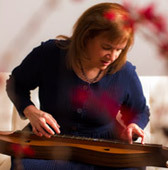 Nina is especially fond of the “softer side of dulcimer.” She has produced several books of solo arrangements for mountain dulcimer and has co-authored four books of duet arrangements (the Tunes for Two or More series, including the new Tunes for Two or More Christmas Edition with Beth Lassi.) She has a strong interest in American folk hymns, many of which appear in her tablature book Glories Immortal: A Collection of Hymns from America’s Past and in a new book of Shaker music (co-authored with Bill Collins), The Humble Heart. Here other musical love is early music, featured in her latest tablature book, Heart’s Ease. Nina is featured on Masters of the Mountain Dulcimer Play Music for Christmas (CD) and has recorded The Sum of the Parts, a CD of solos and duets with Bill Collins, as well as a solo CD, Beside Still Waters. Her newest CD, Winter’s Light, is a gentle celebration of the quiet joys and consolations of the winter season. One day, during a rather “challenging” time in my life, I was looking for a diversion and happened to see a poster advertising a local dulcimer festival. I went to the festival, brought home a dulcimer, and quickly got “hooked” on the gentle sweetness of the instrument and the warmth of the dulcimer community. Since then, playing dulcimer has been a wonderful adventure, providing solace, joy, fellowship… and a lot of fun! I am especially fond of “the softer side” of dulcimer. I love the slow Celtic airs and quiet, meditative hymns; they bring a sense of serenity and peace. My favorite way of playing dulcimer is to fingerpick with bare fingers: the feel of the strings seems to draw me “into” the instrument and the music and brings me to a place of quiet tranquility. Before discovering dulcimer, my main musical interest was in the “classical” realm: everything from early music to Bach cantatas to Brahms symphonies. I sang in choirs, played piano in pit orchestras, and played violin and viola in string quartets. All these experiences have influenced the way I play and arrange for dulcimer. Some dulcimer players who have influenced my playing include: Susan Trump, with whom I had the pleasure of taking lessons; Bill Collins, who generously shared arrangements and musical tips during my first few years of playing; Beth Lassi, who always challenges me to create harmony parts; and Linda Brockinton, who taught me the “softer side” of fingerpicking. My music is also inspired by the beautiful playing of El McMeen, guitarist, and the glorious harmonies of choral groups such as Chanticleer.